Cost: $45.00 (per person) There will be no refunds after April 25th. Time: Doors will be open at 6:30 pm. We will gather in the Wedgewood Lobby where an International Cheese Display with be served until 7:30 pm. A cash bar will be available all evening. Dinner will be served at 7:30 pm. Be sure to read the invitation with details about the event and an opportunity available to those who register by March 11th. Please join us and share this evening of delicious food, fellowship, and a fabulous program with our guest speaker. This year, we are pleased to have speaker Jonathon Scott Fuqua, who taught illustration and watercolor painting at The Maryland Institute College of Art (MICA) for nine years and last fall opened The Baltimore Academy of Illustration with two other former MICA professors. He will discuss how he became a watercolor artist and how his more formal art and images about urban life and people transitioned into illustration and why. In the process, he will discuss the differences between art and illustration and argue that, in fact, they are nearly one in the same, the barrier between the two being largely perception. A graduate of The College of William & Mary, he has published many award winning young adult novels, graphic novels, and children's books, many of which he illustrated. He has been painting professionally for twenty-five years. 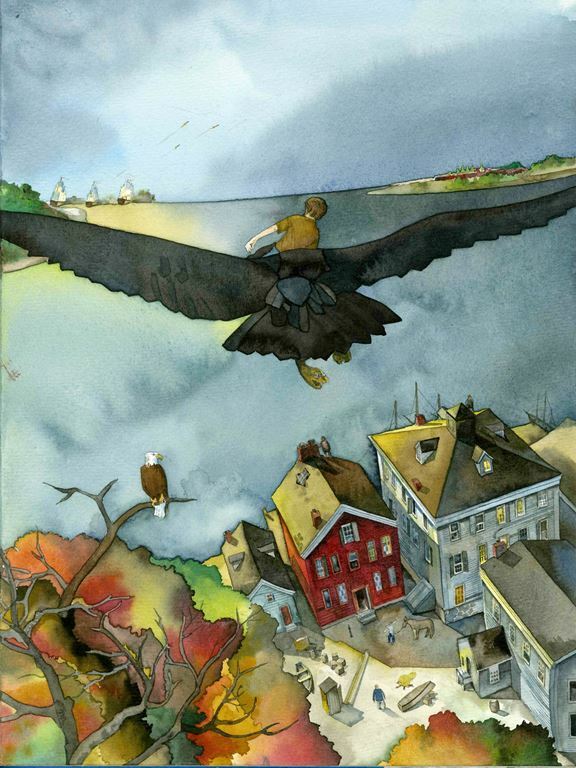 Illustration from Scott Fuqua's award winning book Calvert the Raven and the Battle of Baltimore.